After enjoying Delaware’s 1st Anna’s Hummingbird on the morning of January 2nd Josh Lefever, Mark Mizak, and I drove towards Cape May, NJ. Our primary goal for the day was to spend some time birding Stone Harbor Point, one of my favorite birding locations in New Jersey. Stone Harbor Point rarely disappoints and more-often-than-not, we find species there that we don’t see anywhere else while visiting Cape May County (or at least get some really killer looks). We arrived at the parking lot to walk out to the point at 12:20pm and began the hike out. Like I said, birding Stone Harbor Point is almost always worth your time, but you are gonna have to work for it – its a long hike out and around the perimeter of the point, and the sand and wind is almost always blowing right into your face plus this time of the year, the wind is damn cold. Mark Mizak’s top nemesis bird, the Snow Bunting, should be a sure bet at Stone Harbor Point this time of the year, so our plan was to walk along the dunes on the way out, make a wide sweep around the tip of the point and then walk back along the beach and see what shorebirds were around (really hoping for some cooperative Red Knots). The three of us made it about halfway out through the dunes and hadn’t come across any Snow Buntings yet, or really anything for that matter. I was beginning to get worried, but then Mark yelled and pointed to a large brown bird flushing out of the tall grass in front of him. I expected it to be a Short-eared Owl or Northern Harrier, but when I got my camera on it, I was surprised to see a beautiful American Bittern! As we walked farther out, the dunes started running out and we could begin to see the bay side of the point. Our chances at finding Snow Buntings were decreasing rapidly, although there were a few scattered mounds of dune that we still had to check. Sure enough, as we began walking towards one of the mounds I could hear the calls of a Snow Bunting in flight. We quickly located it on the ground and noticed it was with a second bird! We walked around to the far side of the dune, to get the sun on our backs and watched the two little buntings for a few minutes. Mark was pretty psyched to finally see his lifer Snow Buntings! From there, we walked over towards the bay side of the point to see what shorebirds might be hiding on that side. Surprisingly, there really wasn’t much there although we noticed large groups of Brant and American Black Ducks that had been flushed up by something and were scattering around the area. 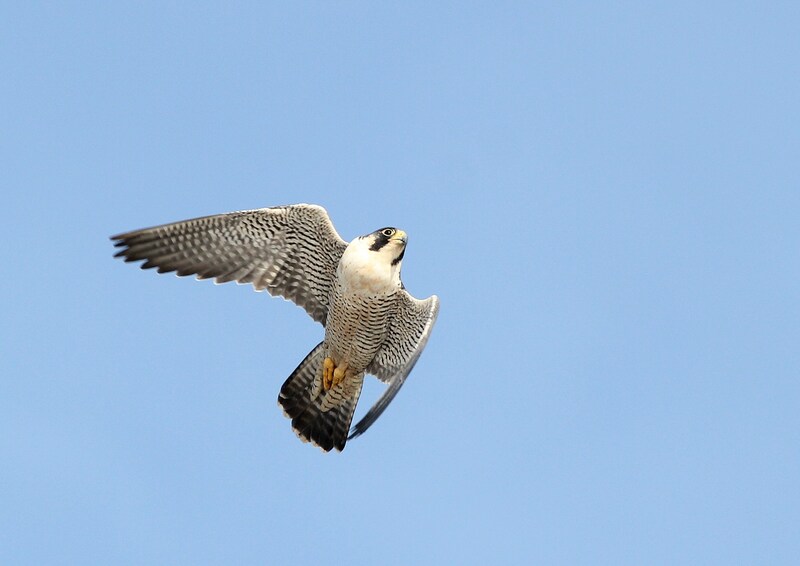 A few minutes later, Mark spotted the reason for all the commotion – a massive adult Peregrine Falcon was sitting on the dunes, a few hundred feet from us! 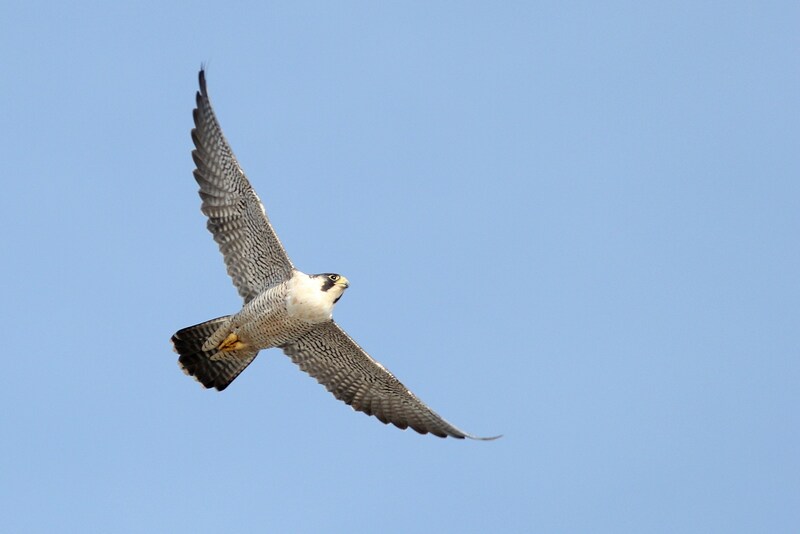 We watched the falcon in our scopes for a few seconds as it sat there, calling loudly, and then flew off to the north. Soon after that we found the remains of a Brant that had clearly been killed and eaten by a Peregrine! As we were examining it, a flock of 21 American Oystercatchers flew in and landed on the backside of the point! From there, we made walked out around the point and then down to the beach. Hundreds of Dunlin and Sanderling were flying past us, only feet above the ground. Some flocks were stopping to forage on the beach as well and we scanned through them for any other species. We picked out a few Western Sandpipers but hadn’t spotted any Red Knots – the shorebird we really wanted to see. A single, adult Northern Gannet was flying around offshore and we could see distant small flocks of Surf or Black Scoters passing by. Red-breasted Mergansers were messing around in the surf and many Herring Gulls were congregating on the point, behind us. Soon we could see that a lot of Dunlin and Sanderling were gathering on the beach back up by a jetty and we tried to high-tail it over there before they took off and headed south past us, like the hundreds of other shorebirds passing by, probably all heading to roost somewhere back in the marsh. As we were walking, Mark yelled out that two big birds were headed our way. I looked up, not really sure what to expect, but then realized it was two adult Peregrines and they really were headed right at us! The big adult female we had seen earlier was chasing off a smaller, adult male! The two birds cut and banked off to our right, almost right above our heads! The male, which was carrying a small prey item, must have gotten the point because it took off to the south and the adult female cut back in front of us and headed back towards the north side of the peninsula, where we had seen it go earlier. After the excitement from the flyover Peregrines, we were all pretty pumped to see what we could find in the shorebird flock ahead. As we got closer to the flock, we set up our scopes and scanned through the birds on the beach. There were mostly Dunlin and Sanderling, but we also saw some Semipalmated Plovers and Black-bellied Plovers mixed in. 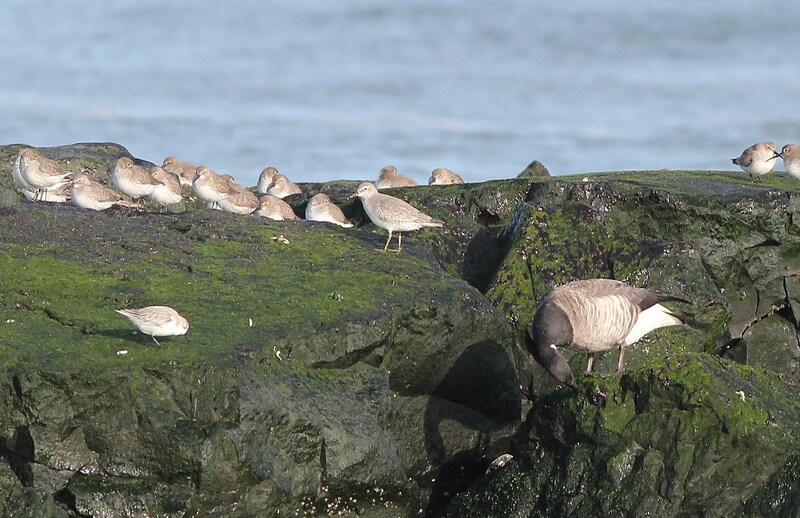 We could also see that the jetty was pretty much covered in shorebirds as well. Scanning through them, we picked out a few Ruddy Turnstones, Purple Sandpipers, and three Red Knots! The knots were foraging around on the jetty and with the sun behind us, we had some really great looks! One of the three knots had a white flag on its leg but we were not able to get close enough to read off the alpha-numeric code on it. From there, we started walking back to my car so we could head to our next Cape May birding location for the afternoon. Stone Harbor, once again, managed to really produce some great birding and stellar looks at quite a few new years birds for the three of us and of course, Mark’s lifer Snow Buntings! 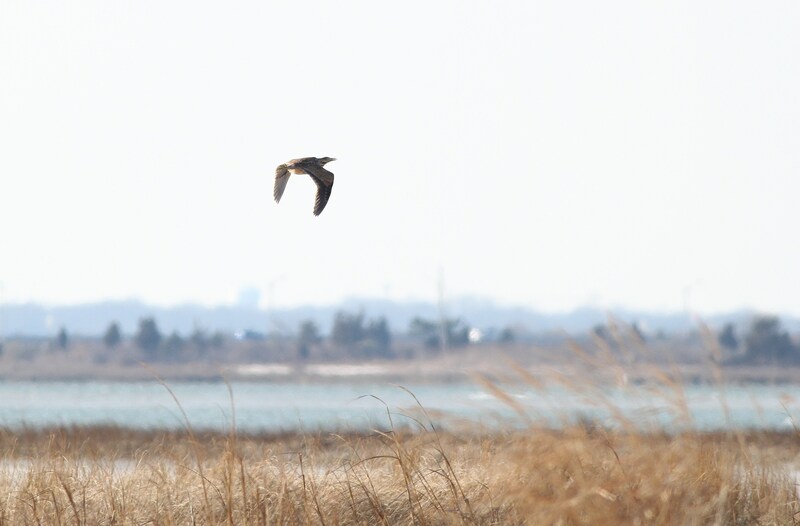 Our eBird checklist for Stone Harbor can be seen here. 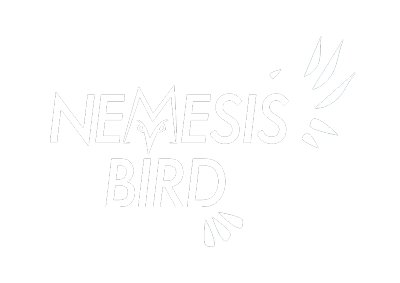 Check back soon for more posts from our New Year, New Birds road trip!